Christ is at the center of everything we do in class and our faith is woven in all subjects. We have a daily religion class where we focus on the Bible’s message of God’s love for us, the Ten Commandments and the Beatitudes. We use the New Evangelization Edition of the Christ Our Life book series authored by the Sisters of Notre Dame and published by Loyola Press – a Jesuit Ministry. Our focus is for students to learn and apply strategies to be a good reader. Our goal is to increase reading stamina, vocabulary, comprehension, fluency and prosody. We use the inclusive Treasures reading series and its accompanying grammar, spelling and writing components by MacMillan/McGraw-Hill. This spiraling process reinforces each unit’s concepts and skills. They also participate in the Article-a-Day series by Readworks.org. We believe better readers make better writers; therefore, our Writer’s Workshop ties into our weekly reading units. Fourth graders will have the opportunity and direction to develop their narrative, persuasive, expository, and descriptive writing in our Writer’s Workshop. In fourth grade, we build on previously learned concepts and take them to new levels. Our students will encounter new concepts and strategies this year, including adding, subtracting, and multiplying fractions; long division; data collection and analysis; plotting line graphs, and other spiraling concepts. Learning games and technology related activities make learning math fun! 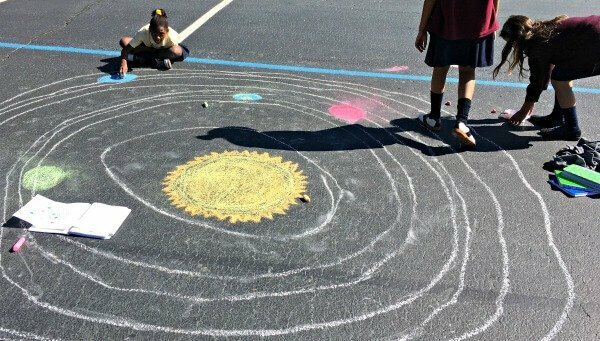 From our solar system to waves and energy…From the human body to rock formation…Fourth Grade goes “to infinity and beyond!” This year we explore and experiment with many different topics and items of interest. We work in teams to demonstrate and experiment. We learn by discovering, using the scientific method. Our students love to develop hypotheses and find ways to prove them. Future scientists and engineers are at work at SJN! Fourth graders will develop and apply map skills and map terms. Fourth grade covers Early U.S. history including exploration of the New World, The American Revolution, The War of 1812 and Western Expansion. They will also identify the Branches of Government and its checks and balances. Technology increases our use of outside resources approved by the Archdiocese. We utilize the computer lab to improve student engagement and increase academic performance. Popular sites include Moby Max, Prodigy, Read Works.org, and World Book online, just to name a few. Studies have shown that homework develops perseverance, responsibility, time management skills, and self-esteem. Practice also builds the stamina required to be a high achieving student. Fourth graders have Math Simple Solutions and Science Simple Solutions every school night. They are also expected to read 10-15 minutes a night Monday – Thursday. Students have a weekly Reading Log where they write two or more sentences summarizing what they’ve read each night. Additional homework is assigned as needed. The fourth-grade tradition is a Saint Project Presentation on All Saints’ Day. Students choose a Saint, then they collect information from research done in class. They create a display that includes pictures and facts - including their saint’s inspiring story and lasting impact on society. Parents, students, and teachers are invited to take part in an engaging presentation where students dress as their saints for a living museum and share details about them. Fourth grade is proud of their service project assisting the Humane Society of Gwinnett County. The students collect needed items requested by the society to care for the dogs and cats they place for adoption. The students set up drop off locations at the school, then sort, box, and label the items. This project gives our fourth graders the opportunity to actively serve their community in the spirit of Saint Francis of Assisi – our grade level patron saint.